Home > Beaded Curtains & Columns > Fabric Top Curtains > Diamonds Beaded Swag "Luna" - Crystal Iridescent 42" x 20" - Choose Rod Pocket Color! 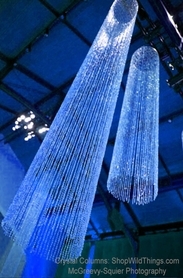 Diamonds Beaded Swag "Luna" - Crystal Iridescent 42" x 20" - Choose Rod Pocket Color! The convenience of fabric rod pockets cannot be overstated and the elegance of our Crystal Beaded "Luna" Swag with an fabric rod pocket cannot be overemphasized! 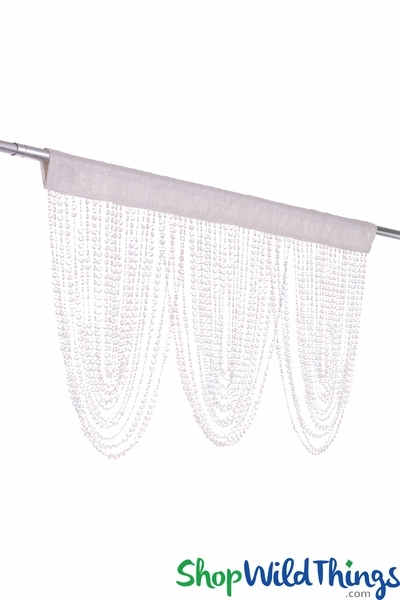 The 3" deep rod pocket is a tightly woven fabric with a light touch of sparkle which only enhances the 20" long, crystal iridescent beaded swags. For the Rod Pocket Color, please choose Ivory or Rose. This valance is 42" wide but the beauty of fabric top curtains is that they can be scrunched to fit small areas or stretched out to cover wider spaces. It's an effortless yet stylish way to totally change up the look of any window, doorway or wall. The strands are sewn into the heavy duty polyester rod pocket and this curtain weighs 1.1 lb. As an accessory for windows, walls and doorways, it's so handy to be able to move the curtain to one side or stretch it out at will. Use a traditional rod, tension rod or add chic sparkle to a Pipe and Drape Ceremony Gazebo Kit by hanging it between the sheer panels. Gorgeous! 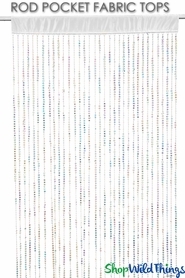 Scrunch the fabric for a condensed look, stretch it out or hang multiples together to cover wider areas. 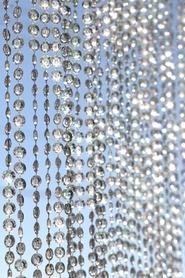 Use on overhead frames to hang as designer room chandeliers or using a double curtain rod, hang in front of string curtains or our matching Diamonds Beaded Curtains! 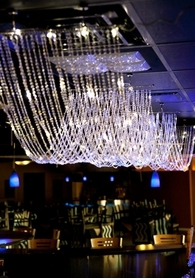 Crystal Beaded "Luna" Swags - hang in seconds for years of glamour and style!